This very scenic metro area of around 84,000 was the filming location for movies like “Caddyshack” and is a proudly rebuilt city after surviving the brunt of Hurricane Wilma in 2005. Emergency Dentists USA is an easy to use portal for you to find an emergency dentist in Plantation FL , if you are here in this Miami-Ft Lauderdale area and are suddenly faced with the painful reality of late night dental issues. Our list of nationwide dentists are carefully selected experts, and Plantation is included in this list! If pain is threatening to dampen your weekend in this sunny and water filled location, we don’t want you to suffer through pain like this! 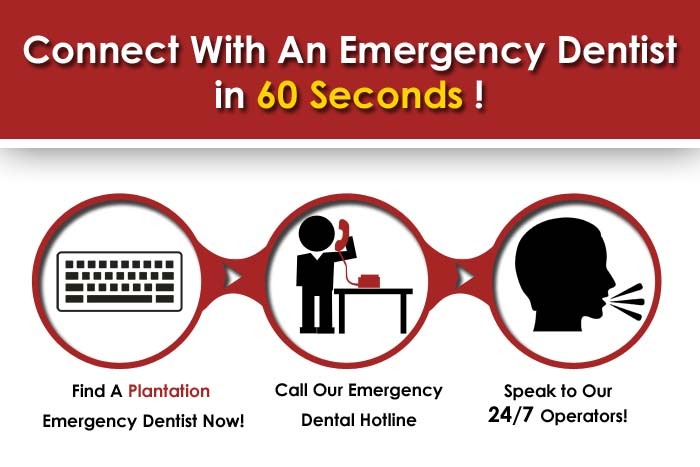 If you are unable to reach any of the dentists in this list, we provide you with a handy hotline that is an excellent way to get connected with a Plantation emergency dentist when time is of the essence. Our hotline is open 24-7, and these dentists are vetted by Emergency Dentists USA. This Broward County FL destination is the national headquarters of shipping giant DHL, and home to MLB baseball player Luis Castillo. The world class Plantation Reserve Golf Course and Plantation Historical Museum are some of the attractions to take in while you’re here. Our hotline is operational 24 hours a day, and can provide you quick relief if you get the tell tale sensitivity to hot or cold in your mouth; this area of the country’s weather and proximity to the ocean is just too gorgeous for you to miss out on. Description: You may encounter an emergency where you need a dentist open on Sunday or an all night dentist; we’ve got you covered either way. When the need arises and someone in your family is in dire pain, the standard 8 to 5 hours are not going to cut it. Since this city is so close to Miami, late night owls and beachgoers can fall prey to all sorts of dental emergencies they are not fully prepared for. Doctors: Michael S. Gorfinkel, D.M.D. Description:This dentist serving Plantation has strived for every patient’s satisfaction since 1991, and is pleased to offer services at discounted rates. Reviewers have named them as very pleasant and that the wait times are short; which your going to find as a real bonus for a walk in dentist. Patient Roger’s testimonial says that his root canal service was flawless, and that they were very accommodating. Description:This dentist in Plantation is open on some Saturdays, which is when so many dental emergencies happen for teens and children. When the school week is finished, that’s when the bikes, boards, and blades come out, and sometimes accidents do happen! With over 30 years of general dental experience, Scott has been said to be one of the most accommodating in the business. Don’t let your recent urgent dental pain keep you down and out, and make the choice to see Scott today. Doctors: Dr. Tory R. Lindh, D.M.D., P.A. Description:Listed as a dentist in Plantation that has late hours, Tery has been in practice for over 15 years, and his patients all say that he has changed their lives. He acquired he bachelor’s from The University Of Florida in 1992, and his doctorate from Tufts University School of Dental Medicine. One of the things that he feels are most important is giving back to the community, and he is a huge sponsor of St. Jude’s Hospital and Make A Wish Foundation. This Broward county city boats many reasons to come and stay. The nearby beaches, warm weather, events like the Las Olas Food and Wine Festival, and centers like Broward Center For Performing Arts all offer culture and relaxation. We want to be the portal that provides you comfort and accessibility when you need a 24 hour dentist Plantation FL ! If you want to look at any of these dentists a bit more in depth before you visit, you can visit the The Florida Dental Association .